The image depicts the 101st Airborne Band of Brothers nicknamed the 'Screaming Eagles', about to embark onto their C47 Dakotas for the eventual parachute drop over enemy lines in Normandy. 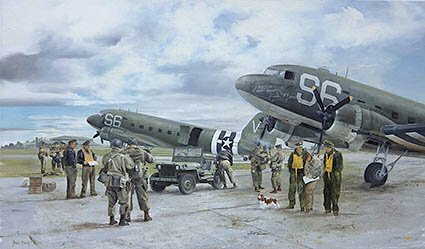 The print features one of the participating C47s 'Night Fright'. This very airframe is still in existance in America presently at this time, June 2014, beng refurbished and eventually being flown back to, and operated from, the UK.